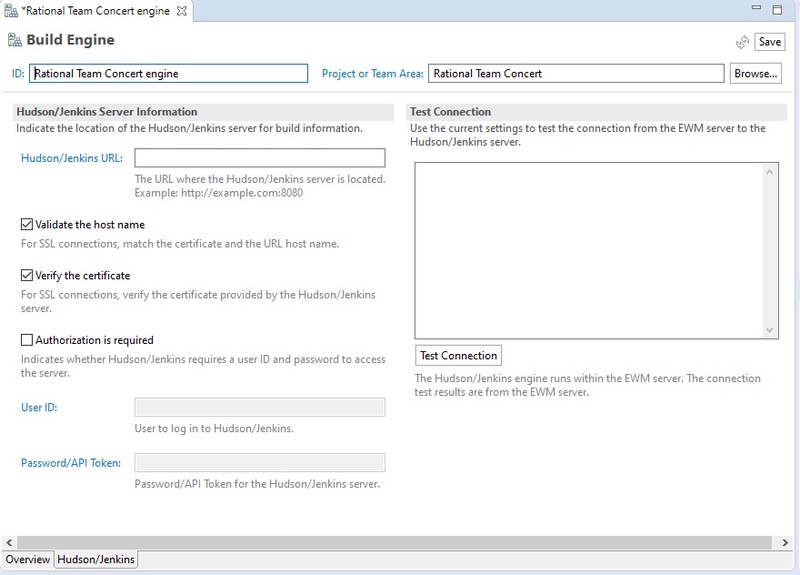 Creating a Hudson/Jenkins build engineThis information is for planning purposes only. The information herein is subject to change or removal without notice before the products described may become available. You can create a Hudson/Jenkins build engine to identify the build system that performs the build. Create a Hudson/Jenkins project, such as a free-style project that runs the Windows dir command through a Windows batch command. In the Team Artifacts view, in the project area, expand the Builds folder. Right-click Build Engines and then click New Build Engine. On the New Build Engine page, ensure that Create a new build engine is selected, and then click Next. On the General Information page, in the ID field, type a build engine identifier. In the Available build engine types pane, select Hudson/Jenkins Engine, and then click Finish. In the Build Engine editor, click the Hudson/Jenkins tab at the bottom of the window. To configure the connection settings, in the Hudson/Jenkins URL field, enter the host name and the port. If your server is secured with SSL, ensure that the Validate Hostname check box is selected. In the User Id field, enter the user name. In the Password/API Token field, enter the password for the user. Tip: For authentication, you can provide either a password or an API token. Optional: To change the maximum amount of time the Jazz™ Team Server waits for a response to a query or request, click the Overview tab. On the Overview page, in the Properties section, change the value of com.ibm.rational.connector.hudson.connectionTimeout. The default value is 30 seconds. Increase the time if the Hudson/Jenkins server is slow to respond. In the Properties section of the Overview tab, click Add. In the Add Build Property window, select String, then click OK. In the Name field, enter com.ibm.rational.connector.hudson.queueOnly, and in the Value field, enter true. Click OK.
On the Build Engine page, click Save. Create a Hudson/Jenkins build definition. See Creating a Hudson/Jenkins build definition.